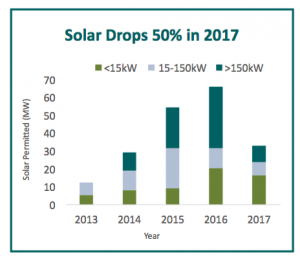 We encourage you to make your voice heard as the Public Utility Commission (PUC) goes through a much-needed review of Vermont’s solar program after a pretty disastrous 2017 per this chart. Solar installations declined fifty percent in Vermont last year. If there were any doubt about the need for more solar (there isn’t), news of the Arctic stewing in temperatures 45 degrees above normal and days of above freezing temperatures in the middle of the Arctic winter are the latest in a litany of far-too-frequent reminders. “Scary stuff, on many levels,” as an Alaskan meteorologist put it. And yet the country (recent 30% import tax on solar panels) and our state are making it harder for Vermonters to go solar. The trend is difficult to fathom. The last few years of healthy growth have put Vermont on the map as a national leader in the adoption of renewable energy. 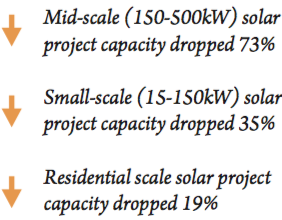 But as expected, as the chart indicates, the state’s revised net metering rules adopted last year drove solar installations back sharply to 2014 levels. Comments should be submitted by email to the PUC at puc.clerk@vermont.gov and it would be very helpful to blind copy (bcc) REV at info@revermont.org so they can track the pace of comments and messaging. We thank you, future Solaflect Tracker owners thank you (they will, anyway :), and Vermont thanks you — in advance, for taking a few minutes to reach out to the PUC.